Kunming is divided into 5 districts, 8 counties and 1 city administratively. 5 districts in urban area include Wuhua (wǔ huá qū 五华区), Panlong (pán lóng qū 盘龙区), Xishan (xī shān qū 西山区), Guandu (guān dù qū 官渡区) and Dongchuan (dōng chuān qū 东川区) . 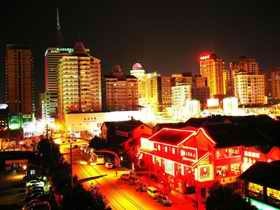 Kunming has a total population of more than 4.55 million. In its population, there are 26 nationalities with a total ethnic minority population accounting for 12.55% of the total population of the whole city. Throughout the ages, people of different nationalities have developed their own peculiar life styles, customs, institutions, traditional festivals, cultures and art forms all of which constitute a gorgeous picture of varied ethnicity. Kunming is well-known for its beautiful landscape, agreeable climate and fresh flowers blooming throughout the year. Here more than 400 types of flowers are blossoming and competing with each other for beauty and fascination. Of these flowers, camellia, yulan magnolia, azalea, fairy primrose, lily and orchid are known as the six famous flowers of city and camellia is its city flower. Kunming, located between 24°23´ and 26°22´N, and 102°10´and 103°40´E, is situated at the high plateau of the eastern part of Yunnan Province, with a total area of 21,600 square km. It is skirted by mountains to the north, east and west, and Dianchi Lake (diān chí 滇池) in the south. Its widest stretch from the east to the west amounts to 140 km and its largest expansion from the north to the south amounts to 220 km. 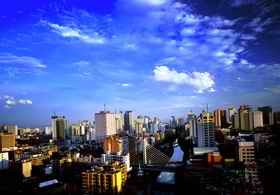 Its downtown area is 1,891 m above sea level. Kunming is rich in phosphorus, salt mine and quartz and other such mineral resources as mirabilite, iron, bauxite, copper, coal, etc; it is also rich in ground water and geothermal energy resources. Kunming belongs to the subtropical plateau monsoon climatic zone; it is free from bitter cold in winter and torrid heat in summer with an average temperature of 9°C in winter and 23°C in summer. It has an annual average temperature of 15.1°C. "Climate remains like that of February and March, and flowers blossom throughout the year" vividly depicts its climate of perennial spring. Furthermore, in Kunming dry and rainy seasons are clearly marked, with the period from May to October as the rainy season and the rest as the dry season. The city has a mean annual rainfall of 1,000 mm, with an annual sunshine period of 2,250 hours and an annual frost-free period of 230 days. In 109 B.C., the Western Han Dynasty arranged Yizhou (yì zhōu 益州) County here and incorporated Dianchi Lake area into the domain of Central Plain dynasty. In the year of 765, Nanzhao State (nán zhào 南诏) expanded its eastern city, which is the incipience of Kunming. During the period of Dali State (dà lǐ guó 大理国) (937-1254), it was called Shanchan (shàn chǎn 鄯阐) Town. Tuodong (tuò dōng 拓东) Town and Shanchan Town were respectively the eastern capitals of Nanzhao State and Dali State. In 1276, Kunming arranged Zhongqing (zhōng qìng 中庆) Town and was made into the provincial capital for the first time. In the Ming Dynasty, large number of migrants moved into Yunnan and population of Kunming exceeded the aboriginal dweller for the first time. In 1919, Municipal Administration was arranged in Yunnan and this is the outset of municipality establishment in Kunming. On August 1, 1922, it was changed into Political Administration of Kunming City. On August 1, 1928, Government of Kunming City was established. During the War of Resistance against Japan, Kunming was a key economic, cultural and military city in support of China’s war of resistance, so it became the famous “Fortress of Democracy”. In December 9, 1949, Kunming was liberated in peace. 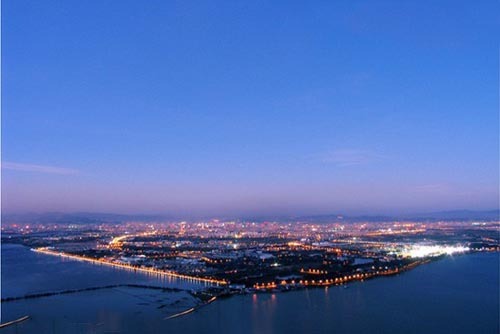 Except Dianchi Lake, World Horti-Expo Garden and Western Hills, there are plenty of scenic spots in the city of Kunming. The Cuihu Lake (cuì hú 翠湖) on the west side of the Wuhua Mountain (wǔ huá shān 五华山) is extolled as a "Jade in Kunming". Two long dikes divide the lake into four parts. The entire Cuihu Park is a green world, with willow trees swaying gently on the dikes, and the surface of the lake covered all over with lotus plants. All the year round the park is the venue of one sort of exhibition or another, and with its snug seclusion it is frequented by local residents who come here for a few hours of leisure. In winter and spring, Kunming residents flock to the Cuihu Park to feed red-beaked gulls - there are tens of thousands of them, which descend upon the lake. This lovable scene, in which man, birds, and nature mingle in such harmony, has kept occurring over the last ten years. 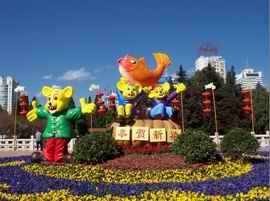 The love of the Kunming people for wildlife has added to the charms of the City of Spring. Performances of Chinese operas and people watching make this park a pleasant place to spend time. Daguan Park (dà guān yuán 大观园), located in the southwestern suburb of Kunming City, is a picturesque lakeside park. In the 35th year of Emperor Kangxi (kāng xī 康熙)(1696), the governor of Yunnan, carried out a largescale construction of a two-storyed pavilion. Ponds were dug, embankment was constructed, and trees and flowers were planted. With a good view of the waters and hills in the distance, and the sailing boats and trees in mist, the pavilion was titled Daguan (Grand View) pavilion (dà guān lóu 大观楼). In the later years, the Daguan pavilion had twice been reduced to ruins by warfare and flood. 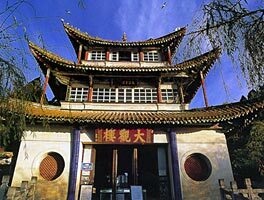 It was renovated in 1883, the 9th year of Emperor Guangxu (guāng xù 光绪), and the pavilion has remained intact ever since. Since the Daguan pavilion was built, men of letters coming from far and near have often gathered here, composing and reciting poems. During the past two to three hundred years, many excellent works and poems have been created. Among them, the long couplet with 180 Chinese characters written by Sun Ranweng (sūn rán wēng 孙髯翁) has for many years enjoyed the highest reputation around the world. Daguan Park has become famous due to Sun Rangweng's Long Couplet. 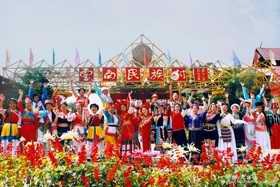 Yunnan Nationalities Villages (yún nán mín zú cūn 云南民族村), situated six kilometers south of Kunming, is a 2,000 mu theme park bordering on the south by the Dianchi Lake and on the west by the famous Western Hills Scenic Area. In the Yunnan Nationalities Village, 25 villages are meant to be built for each of the 25 ethnic minorities in Yunnan. There is a square symbolizing unity among various ethnic groups, a theatre for the performance of ethnic songs and dances, a folklore museum, and a museum of ethnic waxworks in it. The Yunnan Ethnic Villages is an epitome of Yunnan as a multi-ethnic province, and an immense garden in south Chinese horticultural and landscaping traditions. 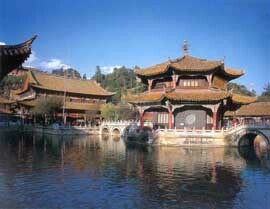 The Jindian park (jīn diàn 金殿), also named as Golden Temple, sprawling for more than 2,000 mu on the Mingfeng Mountain (míng fèng shān 鸣凤山) seven kilometers northeast of Kunming, is a national forest reserve. The exquisite and serene Golden Temple is 6.7 metres in height and 7.8 metres in width, and cast of 250 tons of solid bronze. It is the largest bronze hall in China. With a natural scenery mingled with sites of historical interest and man-made gardens, Jindian park is also a large scenic resort in Kunming. 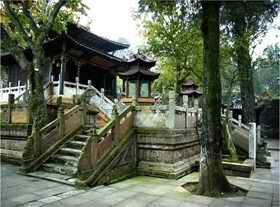 The Yuantong Temple (yuán tōng sì 圆通寺) is the most famous Buddhist temple in Kunming with more 1200 years’ history. In the 1950s, it hosted a grand ceremony to greet and send on the sacred teeth of the Buddha and so became important in Southeast Asia. This old Temple is noted for its unusual structure which is high at the front and low at the back. From the front archway named "Yuantong Shengjing" (yuán tōng shèng jǐng 圆通胜景)(Wonderland), one can behold the entire garden. To the north is the splendid Yuantong main hall. At both sides of the hall are covered corridors running beside clear pools. This structure of a Buddhist hall surrounded by water is unique in China. The main hall maintains the style of the Yuan Dynasty architecture .Circling the two central pillars inside the hall are two giant dragons carved during the Ming Dynasty. The blue and yellow dragons face each other, as if they are ready to fight. 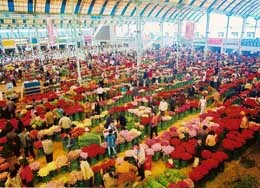 Dounan (dòu nán 斗南) is the biggest flower market in Yunnan. Everyday there are over 10000 people trading in it. The flowers are not only provide to our country but also to Japan and Korea. This market has a great influence both on Yunnan and the whole country. 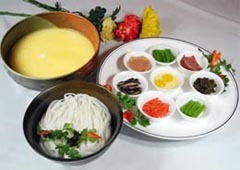 It is a typical Yunnan local flavor that could only be tasted in some parts of Yunnan. The Over the Bridge Rice Noodles (guò qiáo mǐ xiàn 过桥米线) has a long history and it carries with itself a vivid love story. All visitors to Yunnan, never forget to taste the cross bridge rice noodle. This famous dish consists of several courses and a big bowl of chicken soup with very thick oil on top to keep the heat for cooking the food items, including raw pork, cooked chicken pieces, pork liver, slices of squid and slices of carp for the first course to be dipped into the boiling hot soup. 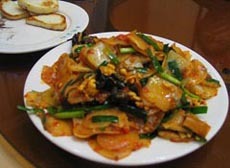 Vegetables are then added afterwards as the second course, and the rice noodles follow as the last course. It is a kind of snack food in Yunnan. 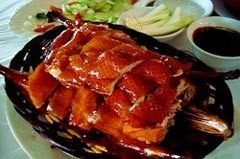 Have you ever heard that the Yiliang Roasted Duck (yí liáng kǎo yā 宜良烤鸭) can be compared with the famous Beijing Duck? Only they are roasted each in their own way. Therefore, they have different tastes. The "Goujie (dog street) Roasted Duck" (gǒu jiē kǎo yā 狗街烤鸭) produced in the Goujie Street of Yiliang is extraordinarily delicious, with the crispy and yellowish skin, soft and tender duck meant, has a special slight flavor of pine needles. Xuanwei Ham (xuān wēi huǒ tuǐ 宣威火腿) is also famous as Yunnan Ham, one of well-known hams in China. The history of Xuanwei ham dates back to the fifth year of YongZheng (yōng zhèng 雍正) times in Qing Dynasty (AD 1727). Xuanwei ham won a prize at the Panama Fair in 1915. Xuanwei ham has been selling well to Southeastern Asia and European countries. As a rule, the Xuanwei ham is processed during the winter. Select the best pork leg and press out the pork blood completely. Rub it with salt and smoke or air it dry after the salt permeates to a certain depth of the pork. Try to test the pork leg in three when the surface of the pork turn in green. The quality standard is to have the ham fragrance from three needles punched in the pork. Cut the ham open from the middle, it looks bright in color and has a clean fresh color. It can be preserved well in cellar with low moisture or in a warehouse with good air conditioning. 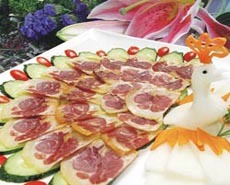 Xuanwei ham can be bought from any big or small stores. If not convenient for traveling, it is possible to by canned Xuanwei ham. Er Kuai (ěr kuài 饵块) is made of quality rice, pressing it into cuboid after the rice is cooked, so it is called "rice cake". It is a very popular local dish, it is indispensable to every household during Lunar New Year family party. There are different ways in cooking Er Kuai. You can boil, roast, or oil fry it. A special cooking method is to smoke it over a charcoal fire, then put some jam on the top. Er Kuai cooked in the way is often found at the breakfast table in Yunnan. Grilled smelly bean curd is one of the popular snacks found in the night snack market in Kunming. 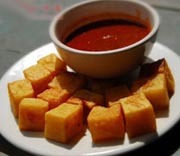 Quality Bean Curd is used as the raw material and it is gilled over a charcoal fire. If you have chance to be at the night snack market in Kunming, remember to experience it yourself. Braised Fuliginosus (hóng shāo jī cōng 红烧鸡枞) is unique in Kunming, a famous dish. Fuliginosus is a special product of Yunnan rare wild edible mushrooms, fresh taste, sweet, tender, sweet, and chicken could be comparable to, but also the stomach, refreshing. Fried pea flour (yóu zhà wān dòu fěn 油炸豌豆粉) is a traditional folk snacks, has a long history, eat when sprinkled with salt and pepper, taste crisp, fresh, taste good, lead a person to endless aftertastes. Fried pea flour can easily find in many restaurant in Kunming and it is a unique food in Yunnan. All visitors to Yunnan, never forget to taste it. 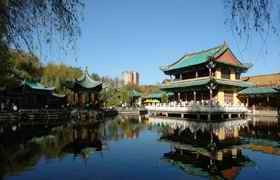 Kunming is a hub of communications of Yunnan and a gateway of China to Southeast Asia. Kunming Changshui International Airport (kūn míng zhǎng shuǐ guó jì jī chǎng 昆明长水国际机场), a new international airport in Kunming slated for completion by 2011. It is projected to be China's fourth largest airport and one of the world's top 80 airports. The new airport is expected to greatly increase the city's access to countries in Southeast Asia and South Asia. Information about flights, airport express can be found in the website - www.ynairport.com. Kunming is the main rail hub of Yunnan province. The Chengdu-Kunming Railway from Sichuan, Shanghai-Kunming Railway from Guizhou, and Nanning-Kunming Railway from Guangxi converge in Kunming from the north, northeast and east. The Yunnan-Vietnam Railway runs from Kunming southeast to Hekou and Lao Cai on the Sino-Vietnamese border and then on to Hanoi. The Kunming-Yuxi Railway runs south to Yuxi, where a second rail line to Vietnam is being planned and built. To the west of Kunming, the Guangtong-Dali Railway extends off the Chengdu-Kunming Line to Dali. Tickets are easy to buy at the advance booking office, on the internet (www.12306.cn/mormhweb), or through the phone call (Tel: 0871-95105105 ). China National Highways 108, 213 and 320 intersect in Kunming. Highways link Kunming to Thailand, Vietnam and Laos, and provide Yunnan province access to seaports of Southeast Asia. There are five long-distance bus stations in Kunming, which link Kunming to all of other places in Yunnan. The eastern bus station (Tel: 0871-3833680) is in Panlong District nearing Hongqiao Overpass. The western bus station (Tel: 0871)5326258) is in Chunyu road, Majie Town, Xishan District. The southern bus station (Tel: 0871-7361722) is in Liuyi, Guandu District. The northern bus station (Tel: 0871-5727185) is located in Longtou Street, Panlong District. The northwestern bus station (Tel: 0871-8265359) locate in Puji Village, Wuhua District. Taxis start at CNY 8 within 3 kilometers, and 1.8 yuan per additional kilometer. An additional CNY 2.5 fuel charge is levied per trip.